Heroin has become the No. 1 overdose killer in the United States, but the number of fentanyl deaths doubled in just a single year, a new analysis showed. It was the first federal government report to look not only at drug overdose deaths in general, but to dig down and see which specific drugs are killing people. The report found that while oxycodone was the top killer in 2010 and 2011, heroin passed it as a cause of death stating in 2012. Heroin, a cheap street drug, killed 10,863 people in 2014, causing 23 percent of overdose deaths, the National Center for Health Statistics reported. There’s a caveat here. Coroners and others who fill out death certificates have not always listed a specific drug as a cause of death. They are being encouraged to do so, and more death certificates now mention specific drugs than in years past. So it’s not entirely clear if the numbers have changed because specific drugs are being listed more often. Margaret Warner of the NCHS and colleagues used new methods to dig down into death certificates from 2010 to 2014 to find the top killers. “During this five-year period, the age-adjusted rate of drug overdose deaths involving heroin more than tripled, and the rate of drug overdose deaths involving methamphetamine more than doubled,” they wrote in their report. “The rate of drug overdose deaths involving fentanyl more than doubled in a single year (from 2013 to 2014).” Nearly half the deaths involved more than one drug, they found. Related: What is Fentanyl, the Drug That Killed Prince? The top 10 drugs listed on death certificates haven’t changed since 2010, the team found, but their order in terms of deaths caused did change. Health experts have been raising the alarm about drug deaths in recent years. 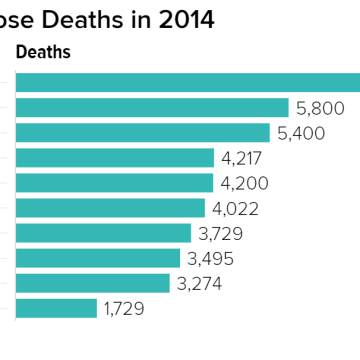 Drug overdoses killed 50,000 Americans last year. The White House has tried to make the opioid abuse crisis a priority, and the Food and Drug Administration and the Centers for Disease Control and Prevention have both issued warnings and guidelines to try to limit prescriptions of killer drugs. The FDA issued a specific warning about mixing anxiety drugs with opioids. The CDC estimates that in 2013, 1.9 million people abused or were dependent on prescription opioid pain medication.